Thank you! I hope you enjoy reading them as much as I enjoy writing them. I am happy you shared this. Congrats on your new life, and may you have the strength to find success and happiness along the way. And thank you for your visit to my site, come back anytime! Thanks for the follow! I look forward to reading more. It is really good to meet you here! Thank you so very much For your kind words. That truly means alot to me. I just wanted to help people in any way I could because I know how we all struggle with different things in our life. Thank you so much for you and your blog! I’d be honored to be a part of your team. Absolutely enjoyed reading this article a lot! Thanks for following me back also looking forward to seeing more thoughts of yourself. Loved the quote! Stay strong. I love your post an honesty. Something i have found on my journey ia that Nutrition is Key… It was for me and was the turning point. Take a look at http://www.zealfacts.com. I’d be interested to know what you think. God Bless and keep fighting the good fight. Oh wow! I am truly honored! Thank you so very much. You have a really great and important blog here, continue the style. I have a son struggled as a kid too, but he is now adult and got his education too, even “all the right people” then told, this would never be possible. So just believe everything is possible, miracles happens. You are welcome. We are here to help each other. Your blog is great and will open up doors for others to share their stories and help each other work through their challenges. Working through my grief and anxiety after my son’s death, I found overtime that is was daily Yoga and Meditation that calmed my mind and balanced my life completely. Im a Counsellor and I have not found any better remedy for anxiety and stress than finding stillness through meditation and yoga. I hope this helps. I always try to get time to do yoga but I usually end up in bed instead. With 5 kids that’s about all you have time for lol. However I used to do yoga a palate when I was younger. At the time I only had two children. It really does help though! It’s true, it is difficult to find time and I notice you said in you writing that “In my life it is important for me to include the two…my mental health and my parenting”. When you make that time a priority for you, not only will you heal but so will your children. I found it always requires effort, but the results for practising yoga and meditation, far out way the benefits! WOW! What a combination! Girl, you and the family will be in my prayers. I try to post daily on my blog, hope they are helpful & inspirational to & for you! God bless & Godspeed! Thank you so very much for your kind words! I will definitely be checking your blog regularly. Hi Darc! What’s your personality type? Have you taken the test yet? Hi! I am the administrator of Mental Health Advocates United page on Facebook. I shared your page on there and read some of you blog. I am wondering if I could post some of my blogs on yours. I also am always asking people to be guest bloggers on mine so would love it if you would share too. I, like you would want you to include all your information and would give you credit. What’s the next step? My blog is bipolarbandit.wordpress,com if you want to check it out. The best way to contact me is by writing me a message on the page you posted on. Thanks. Would a person be ashamed of a cold or the flu? No, then they should no feel ashamed of mental illness. Thank you for following me and the comment. I truly appreciate your support! When I came across your blog I thought to myself that you were someone who can offer help, information, and inspire others, such as myself. Thank you!!! I am truly honoured, thank you. Hello! Thank you for following me. I’m so glad because now I’ve found you. Congratulations of your new life with your family and I wish you so much healing. My husband and stepdaughter suffer from ADD and we suspect my 80-year-old mother of having ADHD. You have so much to share and I look forward to reading them and I will be more than happy to share whatever I can from my own experiences. Your blog is inspiring and encouraging as well. So thank you for helping others! Thank you so much for the follow back and for sharing my post! I love what your blog is about and I wish you all of the best in your journey. I look forward to coming back here on a regular basis to find inspiration and advice. http://onesahmscrazylife.wordpress.com/2014/05/27/twisty-tuesday/ I nominated you for my shout out award. I think it’s awesome that you are putting your experiences out there for others and that your family helps you in the cause! You’re an awesome person for this and thank you for the follow! Thank you so much for your kind words. The purpose of this blog was to help others and I’m glad that others think I am doing just that! Stay amazing! Thank you so very much Barbara. Your kind words mean a great deal to me. Mental illness runs on my Fathers side of my family unfortunately. I hope the very best for you! You have such a positive and informative blog. I’m very glad I found you through the Twisty Tuesday post (and thank you for the follow)! I really look forward to checking more of it out! Amazing blog! Great info and love the support and encouragement given! Thank you so very much! My goal is to help give information and encourage others, so I guess I am doing something right lol. Wow, you have a lot to cope with. My son is 30 and was diagnosed with ADD when he was 5. That was 25 years ago. Not many kids were diagnosed with it back then. Yet today any kid they can’t put into any kind of box, gets diagnosed with it! Thank you so much for caring. I truly appreciate it. Before my husband was diagnosed with Bipolar disorder they said it was just depression, yet something just didn’t make sense. When he was finally diagnosed and got on the right meds he was doing so much better. You are right about children being over diagnosed. They need to really find out what’s wrong (if anything is). I’m glad I came across your blog! I wish you the best! Thanks for the follow & the reblog! I appreciate it! I look forward to what you post on your blog & hope you & your family well. Thanks for visiting my blog a while back, so I could find you. Tell your son to take heart, both of my kids have/had ADHD. My son more so (very hyper) and my daughter (very quiet) lol. Did you know that about 85% of “Gifted” kids have ADD, ADHD, Anxiety Disorder &/or OCD. My daughter graduated after 8 years of medical school with a 4.0 and my son went straight into the Air Force after High School, then “looked for himself” for a couple of years… met a great gal, and started college which was totally different from his experiences his first 12 years. He got 2 different degrees, but was told he was too smart to teach “those” kids. (after 2 years of teaching and being so popular, he was going to leave anyway due to the over an hour drive to get there, but he had more kids pass the History Exam in HS that year than all the last 5 years put together… I have Anxiety disorder, am slightly OCD & ADD, so I can relate. 😀 Hang in there…. things get better. It is so wonderful to hear that your children have done so well for themselves. It proves that there is light at the end of the dark tunnel. I try to encourage my son and let him know this regularly. One day he will realize it because eventually everything will come together for him 🙂 Thank you so much for your support! Thanks so much for visiting my site and choosing to follow along. You and your family are living that Helen Perry quote. 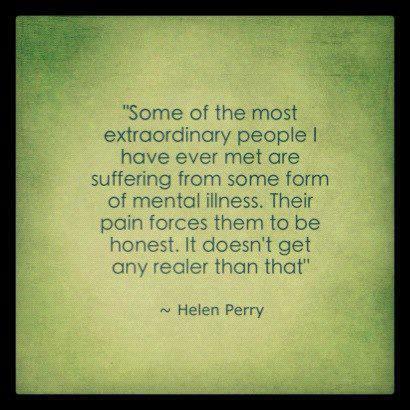 I love this blog and I love the quote you shared from Helen Perry. I wish you and your family peace and harmony on whatever level you can find it. Your blog is very uplifting and helpful. Thank you for writing about such important issues. I am so glad you feel that way. Knowing that my blog is helping others keeps me going. Thank you! Hi, thank you for finding my blog – it’s been fascinating finding yours in return. I was wondering if you’re doctors (Primary care physician?) has rested you for MTHFR gene mutation? I was surprised (mildly put) when I was and it came back positive. It answered so many questions. As I read your post it kept going through my mind and would answer the questions about why/how your children have/ may have other symproms, ailments as you do, or even as you have. Boy that’s a mouthful. It helped me – and my daughter when I got my results. It may be worth a look if you haven’t already done it. Looking forward to making your blogging and life journey. Hello, it is a pleasure to meet you. Thank you for taking the time to visit, and the like on my blog. I admire your honestly about the struggles in your family. God blesses all of His children! Blessings to you all! Thanks for visiting and following my blog. I must admit I know very little of mental disorders etc. but was deeply impressed that with all the problems you’ve had to face you’re still concerned for others and “in there fighting” with a new relationship, child and additional responsibilities. I suspect you are stronger than you think! I appreciate your kind words. It is comments like yours that truly inspire and encourage me to keep going. I can’t thank you enough! Awesome. I have anxiety disorder and am hyperactive. No meds, I go crazy. Will be interested to hop around your blog a bit and see what you’re up to. Hi! We nominated you for the Very Inspiring Blogger Award because your blog is wonderful and we enjoy reading it. You may have been nominated before, and you do not need to make a response post back if you do not wish to, but we wanted to take the time to recognize you. Thanks for sharing your work. It is amazing how much we have in common. As we fight our own battles we try to encourage and inspire others. I am truly grateful for finding your blog. Thank you for following Youth of a Nation! Thank you for writing about these very important issues that so many people struggle with. It is so important that others are brave enough to give a voice to these challenges so that more people know how to speak to them. I hope this finds you feeling well today. I stumbled upon your blog by chance…I am so glad, right now I am in some desperate need of some positive thinking to read about by others who suffer the same as myself. I too suffer from depression and chronic pain,my husband suffers from epilepsy and depression and pstd after loosing his 8 yr old daughter after being hit by a car. I raised twin boys that was diagnosed addhd/and one of them was dyslexic. I am now a grandmother but still suffer the same as I did raising my own, but with a twist. I look forward to your encouraging words and thoughts. I am so glad you found my blog because that allowed me to find yours! It gives information and support for people who have nowhere else to turn. You are truly helping others! Hi, I see that you began to follow my Pain Management Insights on twitter. I came to you site to see who you are. Very impressive and therapeutic for people. I grew up with chronic pain. I am a psychologist and have worked helping those in pain for years. You have quite a load that you carry. Take care of yourself. Remember to pace your energy and that nothing is a disaster. That does not mean it is not bad but a disaster is 100% bad. I told a client the other day who suffers from anxiety and pain about my mother. She became quite ill and still is. It was very hard on all of us especially my father but I learned something. I learned how much love is in our family – how well are parents taught us. I learned how hard times remind you of your courage. And I learned that my father, who I always knew to be a good man was a trully Good man. He sees my mother every day. Carry on. Even though I have my own health issues I like to help others that need information, inspiration, guidance, and love. I can not express how much your comment means to me. You definitely wrote it at the perfect time.Things have been rough for me and my family lately and your advice and voice of confidence truly helps.Thank you!